The Intex 1500 Gallon Per Hour Pool Filter Pump is a 1500-gallon per hour pump that works in conjunction with most filter systems. The Intex Wet Set Krystal Clear 1500 Gallon Per Hour Pool Filter Pump works best on Intex Above Ground Swimming Pools including the Intex Easy Set, Frame Set, Ultra Frame, Ellipse Oval Frame Pools and Sand N Sun Pools. Finding a pool pump that will help keep your swimming pool clear can be a challenge but the Intex Above Ground Swimming Pool Filters can offer a more effective and more efficient way to help keep your swimming pool cleaner, longer. The Intex 1500 Gallon Per Hour Filter Pump is easy to install, connect the hoses securely and plug in the pool into a standard electrical outlet and it is ready to work. 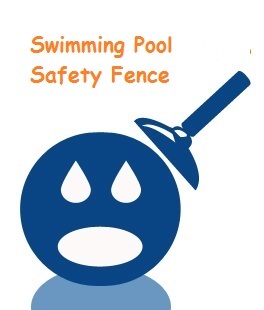 The pump is a double insulated pump, which will prolong the life of the swimming pool pump. The Intex 1500 Gallon Per Hour Pool Filter Pump comes equipped with a Timer. The timer can be set for 2 hours, 4 hours, 6, 8 and 12-hour intervals. The timer is easy to operate; the first step is to turn on the pump by pressing the timer switch to the desired time. The Intex 1500 GPH pool pump will start to filter the swimming pool water until the desired time is up. You have to remember that the timer will be set to operate the same tome every day automatically until you reset the timer setting. 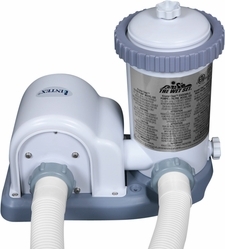 This Intex Swimming Pool Filter Pump comes with the Intex 1500 Gallons Per Hour Pump, two hoses measuring 1-1/2 inches. The pump comes with two plunger valves and two strainers. The pump also is equipped with an air release valve that is designed to trap air inside the filter chamber. You will not need any special electrical outlets; this pump uses 110-120 AC volts. The pump is equipped with a waterproof on and off switch that is easy to locate on top the pump. For best results the Intex 1500 Gallon Per Hour Pool Filter Pump works with the Intex Model 59900 Type A Filter Cartridge. You can find the Intex 1500 Gallon Per Hour Pool Filter Pump on websites such as Amazon, YoMart and BrandsonSale. The price varies from $119.00 to $129.00. To make sure that you are getting the right size pump for your Intex Swimming Pool, read the owner’s manual to read the manufacturers recommendation on filters and pumps. Amazing! Its genuinely awesome article, I have got much clear idea on the topic of from this piece of writing.